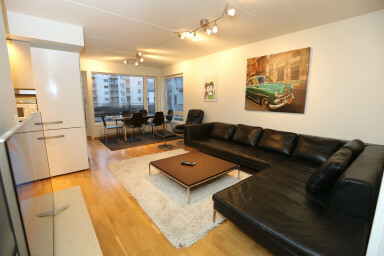 This large flat by Sonderland Apartments has 4 bedrooms and can accommodate up to 9 guests. It has a living/dining room and a full kitchen. This flat by Sonderland Apartments has 4 bedrooms that can accommodate up to 9 guests. There is a total of two double beds and five single beds. It has a living/dining room area with a large sofa, big flat screen TV, and a dining table and chairs. There is also an open kitchen where you can find everything you need to make your own meals: kitchen- and tableware, a stove top, oven, fridge and freezer, dishwasher, toaster, microwave and a coffee machine. Linens and towels are provided, but we do not offer shampoo or food items. A well stocked supermarket is located right beside the building entrance. The bathroom has a shower and is equipped with a washing machine and a tumble dryer that guests can use free of charge. There is also a hair dryer and an iron. A crib is also available upon request. The apartment has a balcony with a small seating area facing the inner courtyard, Wi-Fi is free of charge, and there is an elevator in the building. There is also access to the rooftop terrace and the children's play area inside the building complex. Cozy cafes and restaurants are right nearby. The subway station, bus and tram are only 350-500 meters away and there are 400m to the Oslo Bus Terminal. Karl Johans gate, Oslo's main street with restaurants and shopping, is a short 15 minute walk away. We have other smaller apartments on the same building. If booked together, they can accommodate a very large group. There is an indoor parking space available against a fee, please contact us for vacancy first. Please note the garage is 2.1m tall. The minimum age to check-in in this apartment when not travelling as part of a family is 24 years old. Please note that it is strictly forbidden to have parties in the apartment. This property will not accommodate bachelorette/bachelor or any kind of parties. This apartment is located in residential building and a strict minimum noise policy is enforced at the building after 22:00.